There is a mistaken belief that when it comes to lesbian dating there is no need to worry about scams because there are no men involved. Unfortunately, sometimes the opposite is true. Is the "perfect profile" you just viewed potentially the love of your life... or nothing more than a cold-hearted lesbian dating scam? "Catfishing," the practice creating fake online dating profiles to lure in the unsuspecting, may range in spectrum from a simple misrepresentation of their appearance to being another person entirely. These scams can be quite convincing and very clever. 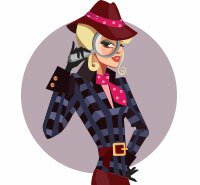 Read on for our 7 clues you should look out for to avoid falling for such a person. 1. Could I Take a Rain Check? Many people who catfish never really intend to fall for anyone – they just like the attention that being online with a fake profile gives them. Consequently, they often don’t have any inclination to meet up. They may encounter chance complications or constantly find excuses. Fact is, whether it’s for the thrill or a more serious scam, they have no intention whatsoever to actually meet you. If you want to avoid scams, you should make sure to meet up before you get too close to someone. Better yet, most lesbian dating sites offer the option to video-chat. Be smart and take advantage of this feature to see exactly who is “hiding” behind those smooth words. Catfishing doesn’t always mean being someone else altogether. In fact, quite often it just means misrepresenting your appearance to a significant degree -- trying to hide ten pounds or ten years. If your new interest’s photos are blurry Polaroids, it’s likely that she’s hiding something from you, something that she might not be entirely secure about. If your gut feeling tells you something doesn’t feel quite right, just ask her for a recent picture before you meet up to avoid an awkward encounter. As you browse through her profile you can’t help it but be amazed from her stunning photos,"How could I possibly know?" you might ask. Fear not, we’re about to teach you how to use one of the easiest and most important tools of online dating safety. Right click your new interest’s photo and save it to your desktop. Load it into images.google.com. This will perform a "reverse image search" which will tell you whether this picture was pulled from anywhere on the web. If this picture happens to come up on a modeling site in the Ukraine and you’re speaking to an accountant in Idaho, well… something is fishy. Sometimes catfishing takes a darker, more insidious turn; some scammers really are out for the money, your money. It’ll usually begin with repeated references to money problems. Perhaps she needs money for an ill family member or to just help out with the rent. Either way, a potential scammer may ultimately begin asking you for money – often "just a loan. "But beware and don’t give in to these sentimental manipulations. When dollars and cents are brought up, it’s definitely a lesbian dating scam and a sign for you to stop all communication at once. OK, sometimes we’re all guilty of this one. But it happens more often in online dating scams. Suddenly, your potential date-to-be is talking about how wonderful you are and how connected she feels with you. She likes all the same music and movies and food! While it feels so charming and flattering to receive all these great compliments, you should still be in guard. If she’s getting close too fast, she’s either a scammer or a clinger – and neither is the solid basis for a good relationship. Use your common sense here; there are very few legitimate reasons for a person to have a vague profile on a trustworthy site like Match. If someone you’re talking to has few or no pictures and offers little to no information about themselves publicly, it’s probably because they’re tailoring who they are to your preferences as a part of their scam. Just block their account and move on. The final sign of being scammed is being asked to take things off the dating site. The scammer may ask you to connect with them on a messenger service like Kik or even just email them directly. Sometimes they’ll give you an odd looking number – beware! This is often a paid phone service. Take some time to get to know someone on the dating site first. Scammers like to go "off-site" because sites like Compatible Partners have extensive security measures and often catch them. Though you do need to protect yourself online, keep in mind that the vast majority of profiles are entirely legitimate. Most dating sites, such as Zoosk, have procedures in place specifically to flag and delete fake accounts, so that you can feel secure in your new matches. So don’t let these potential scammers deter you from finding your love. Now that you are aware of some of the most common dating scams you can avoid falling into them - and fall in love instead.